Looking for something that isn't in stock? Further down the page, you'll find the beer keg prices for the beers that we can get for you if you make and confirm your keg reservation by no later than 3pm two business days before your event. Need a keg on Friday? Reserve it by 3pm on Wednesday. If you would like to order a keg that is not listed, please call our manager at 608-255-5839 and every effort will be made to accommodate your request. 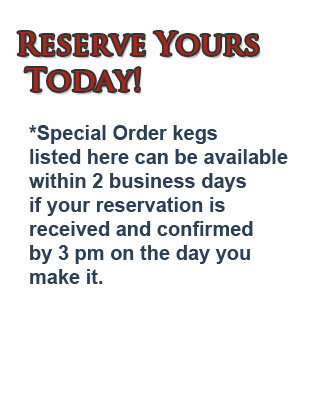 Click here to return to the top of the page and the keg reservation form. You'll be sent an email with a link for you to confirm your requested reservation. Therefore, the email address you specify must be valid. If you do not receive an email within a few minutes time, please check your junk mail or spam filter to ensure your confirmation email has not ended up there by mistake. There's no better way to celebrate a Football Saturday or any other occasion than with beer kegs from Regent Liquor. Our beer keg prices are very competitive and your satisfaction is our first priority. Proud to be your Madison WI Liquor Store, Regent Street Liquor has become traditional part of many a fan's campus experiences. Conveniently located between the Kohl Center and Camp Randall Stadium, be sure to reserve a beer keg from us for your next event or swing by when you're relaxing with friends to browse our wide selection of liquors, wines, and micro brews. 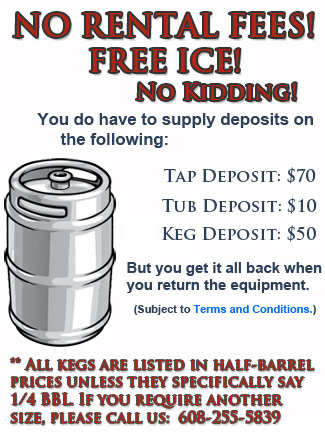 Remember that our beer keg rentals always come with no keg rental fees and free ice!